The GRX-K4416A hybrid recorder supports standard analogue technology and both HD-SDI and Ex-SDI format inputs to provide high definition images over existing coaxial cables. Although the menus and documentation refer to many IP related terms, it is quite easily possible to install with basic CCTV knowledge. A monitor of at least 1920 x 1080p resolution must be used in order to access the menus. The recorder has 16 inputs that can be a mix of analogue (including 760H and 960H standards) and Ex-SDI or HD-SDI. This allows legacy analogue recorders to be replaced and selected camera upgrades to high definition images to suit customers’ budgets. A cable distance guide is given in the quick installation guide rating RG59 to “about 140 metres” and RG6 to “about 180 metres” for HD-SDI with Ex-SDI approximately twice this distance however cable construction and condition must also be considered when upgrading old installations. The recorder was very quick to set up and have operational. Tests were conducted with a standard resolution analogue camera feed and a Grundig Ex-SDI output camera. Both were auto-detected and immediately began recording. After logging into the unit a lower-screen information banner called from the right mouse button provides information such as Time & Date and recording status and gives access to basic Search, Copy, Multi-Screen, Freeze Frame and Main Menu functionality. The HD benefit when compared to the SD input is clearly evident when observing wide areas and the results with an HD test card were impressive with over 1700 pixel resolution identifiable from a visual source. Recording time could not be calculated during a relatively short test period. While the HD-SDI images are transmitted in an uncompressed format they are H.264 compressed for storage onto the drive. The Recording Status screen showed 25 images per second bit rates of 808kb/s for the SD camera and 5776kb/s for the HD so this is significantly more than a typical H.264 source compressed system would produce. However with careful setup to suit the scenes observed and the large capacity drives now available this should not present a problem especially when replacing legacy low capacity recorders. An additional benefit of this unit if cameras are PTZ controlled is the lack of image latency. The front panel Power switch is active by default so it is important to establish user rights and restrict this to Administrator level only, if it is to be accessible to multiple operators. The System User Setup menu also allows some additional security levels such as 2 Men Security and Auto log out after 1 to 60 minutes of inactivity. Restoring factory defaults keeps any video recordings intact. It was noted that the Event Motion setting process was temperamental with the system appearing to freeze with no mouse or front panel response for about 30 seconds until the log-in screen appeared. The Search facility gives a very good timeline that can show individual or all cameras. It spans 10 minutes, 1 hour, 6 hours or a full day midnight to midnight. Using the system to search for specific incidents is very easy and intuitive, the up to 64 times reverse and fast forward play that can be activated via the screen icons or the front panel jog-shuttle control make reviewing large amounts of footage a straightforward task. The FFWD and RWD buttons act as single frame advance or rewind when in pause mode making selection of still frames for image capture easy. A red line indicates your position on the timeline and while this can’t be dragged to a new position the mouse can be used to directly select a new time. The timeline can be switched to identify All, Motion, Sensor or Text recording events. Replay can be performed for individual cameras or from multiples in pre-set formats or custom created views. A Thumbnail mode gives a 7 vertical x 5 horizontal range of images between two date & time selections, simplifying the process of identifying scene changes over time. Images can be exported to an external USB connected drive by selection of “From” and “To” Date & Times; an indication of likely file size is given on screen. The Front panel is well laid out with a central jog/shuttle control and the input selection and function buttons to the right hand side. Two front mounted USB sockets can be used for the mouse and image archive purposes. A power switch is located beneath the cursor buttons but this can be software restricted. On the rear panel are 16 BNC video input sockets identified as “VIDEO IN HD-SDI/960/SD/DR”. Above these are a BNC socket for a Spot monitor output, 4 audio in and 1 audio output phono sockets and a bank of sensor in and relay out push-fit terminal connectors. To the right hand side is the HDMI monitor output along with VGA, Ethernet, eSATA and RS232 connectors. Power input is at the left of the rear panel by way of an un-switched IEC connector. The unit is well built with a main PCB of 37 x 19 cm holding all of the main components. Two sub-PCBs are used to hold some of the rear mounted sockets (alarms and audio) and a larger front-facing PCB for the user controls. A Western Digital Purple 2.0 TB hard drive was fitted with internal mounting space and connectors for three more drives. Space is also available for a DVD or Blue Ray drive but none was fitted in the tested unit. A standard 250watt PSU module keeps all of the mains voltages contained. There was no significant heat generated by any of the devices and good airflow through the chassis should ensure long term reliability when in a controlled environment. A single monitored fan vents to the right hand side of the case. 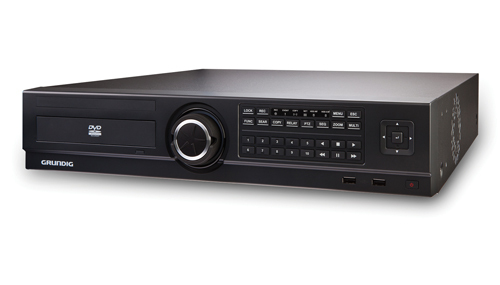 The simplicity of set-up and operation make this recorder an ideal replacement for legacy recording devices and for installers wanting to provide HD performance without providing IP connectivity and needing IT skills. The ability to directly compare SD and HD images will probably also help encourage end users to upgrade more of their cameras when they see the improvement in detail available.